Hidden Gem Stock - Rane Brake Lining Turns 5-Bagger Today! We are pleased to inform you that Hidden Gem stock of May'14 - Rane Brake Lining Ltd (BSE Code: 532987, NSE Code: RBL) has become our 5-Bagger stock today giving absolute returns of 422% to our Hidden Gems members in period of 2 years and 3 months. Our team suggested Buy on Rane Brake Lining Ltd at price of Rs. 200 on 31st May 2014 with a target price of Rs. 410. Target was already achieved and we informed our members to continue to hold it for long term. Stock price of Rane Brake Lining has made new 52 week high of Rs. 1065 today on NSE and closed at Rs. 1044.90 giving as on date returns of 422% in period of 2 years and 3 months. Rane Brake Lining (RBL) declared strong set of numbers and also paid off long term borrowings. 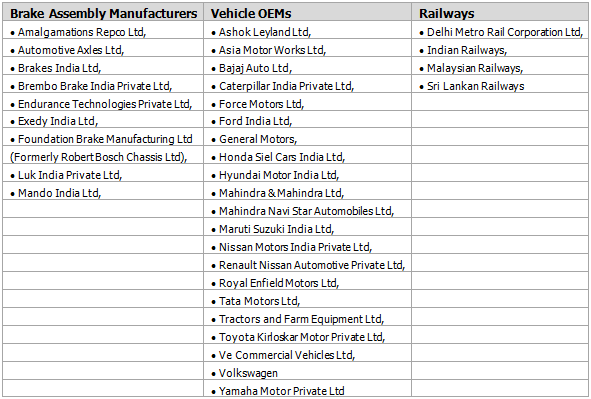 The company registered sales & operating income of Rs. 121.46 crores (up by 17% YoY) for June quarter, as against Rs, 103.62 crores for the corresponding quarter in the previous year, net profit of the company is at Rs. 10.49 crores, up by 117% YoY.